The internet exploded yesterday. At least, the sports corner of it did. For those not in the know, the NFL has been operating this season with replacement referees, having locked out the unionized regular refs in a contract dispute. The replacements have performed, depending on whom you ask, anywhere from "predictably shaky" to "seismically catastrophic." Monday Night's performance, though, was one for the ages. Calls were missed or made incorrectly all game long, but the coup de grace was a time-expired Hail Mary pass that seemed, in replay, to be awarded to the wrong team, completely altering the outcome of the game. For the first time, it seemed inarguable that the replacement refs had cost a team a game. The narrative after the game has only gotten more strident: these replacement refs are doing a job that they're not qualified to do. Most of them are lower-division college or semi-pro refs; one of them even has the Lingerie Football League (NSFW) on his resume. They're simply incapable of doing the job (controlling and administering the rules for the best, meanest, and most out-of-control athletes on the planet) that they've been given. Don't you feel for them? St. Paul says that "sin, seizing the opportunity afforded by the commandment, deceived me, and through the commandment put me to death" (Romans 7:11). When Moses came down the mountain with those commandments, and then Jesus clarified and sharpened them in the Sermon on the Mount, we were given a job that we're not qualified to do, a task that is beyond us. 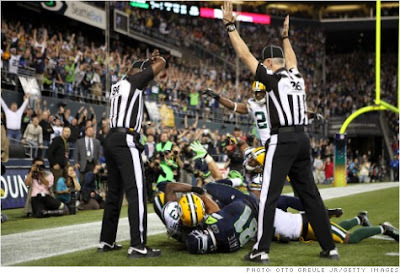 We look as hopeless in our trying as the replacement refs looked on Monday night. But, as Paul also says, "I would not have known what sin was had it not been for the law" (Romans 7:7). We wouldn't know how hard it is to referee an NFL game if the replacement refs hadn't failed so spectacularly. We wouldn't know how far from the righteousness of God we are if the commandments hadn't been brought down from the mountaintop to show us. Failure, though, is the only thing that leads to an openness to salvation. 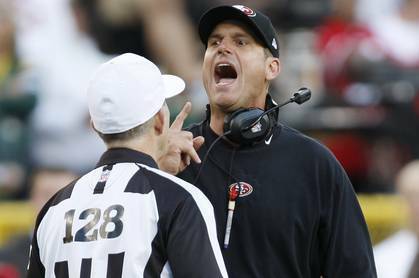 As NFL fans cry out (caution, naughty words) for the salvation of the real refs, they might as well be quoting Paul: "Who will rescue me from this body of death?" (Romans 7:24) It is to a dying man that a savior comes. Jesus promises to be that savior for his creation (Paul rejoices, "Thanks be to God, who delivers me through Jesus Christ our Lord! ")...we can only hope that the real refs come back before He does.